My Forgotten Book for today is The Murder on the Burrows, which in 1931 launched the long and pretty successful career of E.C.R. Lorac. For a debut novel from the Golden Age, it stands up to present day scrutiny rather well, There are a few awkwardnesses about the writing, admittedly. For instance, I think she confuses the ranks of superintendent and sergeant. What's more, the chap who was to become her series cop, Inspector Macdonald (sometimes called Chief Inspector in the story) is given the first name James, although he became Robert in later books. Overall, though, the story is a good one, and it gets off to a swift start when two men discover an apparently abandoned motor car on the Burrows at Bideford Bay. (This area was a favourite holiday spot for the author). The car proves to contain a dead body inside it, though it soon becomes apparent that the crime was committed elsewhere. When Scotland Yard is called in, Macdonald focueses his inquiries in London. The dead man had a Russian name, but in reality he was an Englishman who had become a Communist. Lorac does not dwell on the political aspects of the story, but the deceased is treated rather sympathetically. My impression is that her politics were, at least at this point in her life, left of centre, though I doubt she was one of those Golden Age writers who flirted with Marxism. But there's a liberal flavour to her work in the 30s. Lorac was keen on music, and this is evident when a classical pianist enters the story. Macdonald is roughly in the Inspector French tradition of persistent, if likeable cop, though the fictional detectives who are name-checked are Poirot and Lynn Brock's Colonel Gore (who at that time was much better known than he is today). Macdonald needs to return to the Burrows to resolve matters, and all in all the story is neatly constructed. If you could find a first edition of this rare novel in a dust jacket, it would be worth a great deal of money. Lorac has been a collectible writer for some time, and this is a rare title. But I'm glad I managed at least to track down a second hand reprint. Final Appointment is a good example of the Fifties black and white crime movie. Short and snappy and appealing, with a bonus in the appearance of a future star. This is a story about a series of killings that are clearly connected. A journalist (played by John Bentley) investigates, in collaboration with a colleague who fancies him (Eleanor Summerfiled) and an affable if sceptical cop (Liam Redmond). Bentley has discovered that three men have been killed on the same date in each of the past three years. And that the solicitor is receiving threatening letters. Bizarrely, the solicitor doesn't seem in the least bit bothered. There's not a strong plot reason for this remarkable lack of legal caution. Soon the connecting link between the deaths becomes clear. I felt this revelation might have been held back a bit to increase the mystery. I was also not quite convinced that the motive was strong enough to justify such havoc. Anyway, for most of the film, the focus is on identifying the killer, and trying to avert the murder of the irritating solicitor.. The cast is a good one, and includes that versatile actor Sam Kydd. But I was particularly pleased to spot Arthur Lowe working in the solicitors' office. Yes, Captain Mainwaring himself, looking exactly the same as he did many years later. It's a small part, though; he was a minor figure in those days. Overall, it's a film well worth watching, directed by Terence Fisher with a screenplay by Kenneth Hayles. The source was a play by Sidney Nelson and Maurice Harrison called Death Keeps a Date. I was intrigued to find Death Goes to School , a 1953 black and white movie, on the Talking Pictures schedule recently. Public schools were a rather popular setting for traditional mysteries. Nicholas Blake, R.C. Woodthorpe, Christopher Bush, Gladys Mitchell and others wrote good examples, using the "closed society" of the English public school to provide a conveniently limited pool of suspects. But I'd never heard before of this film, or the novel on which it was based, Death in Seven Hours by Stratford Davis. I discovered that Stratford Davis was a pen-name for Maisie Sharman, who also co-wrote the screenplay with the film's director, Stephen Clarkson. I know little about Sharman, but it seems she enjoyed a remarkably lengthy, if not exactly prolific, career as a screenwriter. According to that useful source IMDB, her first credit was a 1938 film called Night Journey, and her last was a 1973 TV mystery, written as Miriam Sharman. If anyone reading this blog is familiar with her work, I'd like to know more. Death Goes to School is an unpretentious mystery, but competent and still watchable. It benefits from the fact that three key roles went to actors of genuine quality. Barbara Murray plays the likeable young schoolteacher whose scarf is used to strangle a nasty colleague. Gordon Jackson plays the rather macho police inspector and the ever-reliable Sam Kydd is his sidekick. They get the best out of their parts. There's quite a nice joke when Barbara Murray gives as her alibi the fact that she was reading a thriller called...Death in Seven Hours. The plot is competent rather than dazzling. Various people at the school have a motive, as the thinly characterised victim really was very unpleasant. Someone outside the school then comes into the frame. I felt that the motive for the murder wasn't terribly convincing, but despite this weakness, the film held my attention. As with so many of those Fifties B-movies, it's decent light entertainment. Readers of this blog are, as their comments regularly demonstrate, a very well-read bunch, but I'd like to bet that few of them have come across my Forgotten Book for today. Joe Jenkins; Detective was written by Paul Rosenhayn, and trnnslated from the German by Jane Head. The book was published in Britain by William Heinemann - a firm which always had an eye for good material -in 1929. But it's rather got lost in the mists of time. The fact that its appearance coincided with global economic meltdown may well have been a contributing factor. Perhaps more significant was the fact that, unfortunately, the author died in 1929. So who was Paul Rosenhayn? He was born in Hamburg in 1877, and was educated in both England and Germany. He travelled extensively, not only in Europe and the USA, but also in India, and he wrote for British and German newspapers. Rosenhayn turned to writing fiction, and as far as I can tell, he started writing stories about an American private detective called Joe Jenkins rather more than a decade before the Heinemann book appeared. A set of the stories seem to have been collected for publication in Germany in 1916, and they enjoyed great success. Rosenhayn became a prolific writer during the last twelve years or so of his life, and also wrote screenplays. What of the stories? They are set in various locations in Germany, and also in France, and are quite a varied bunch. Jenkins is a sort of poor man's Sherlock, a master of disguise, and renowned for his brilliance, but thinly characterised. We really learn nothing about him as a man - for Rosenhayn, the plot was the thing. And one or two of the plots are really pretty good. Some of the stories have worn better than others, but I found my introduction to this once-popular sleuth quite entertaining. Love from a Stranger is a 1937 crime film, and a very interesting one too. For a start, it's based on a story by Agatha Christie - "Philomel Cottage". Christie adapted it for the stage, but a more renowned theatrical version was written by the actor, director and playwright Frank Vosper. His play had a very good run in the West End, though it didn't do so well on Broadway. His mysterious death by drowning in 1937 is discussed in The Golden Age of Murder. Her life changes in many ways. Above all, she ditches dear old Ronnie in favour of a suave chap who comes to look round her flat when she puts it on the market. The new beau is played by Basil Rathbone, and although the script eventually requires him to ham things up a bit, he brings his customary chaiisma to the role, as well as, eventually, a good deal of menace. But this film also offers a special treat, undreamed of when it was made. Carol's maid, the extremely stupid Emmy, is played by Joan Hickson. Yes, the future Miss Marple makes an early film appearance, in a smallish but striking part. I very much enjoyed seeing this. All in all, it's still good entertainment. Yes, we can guess what's coming, but it's nicely done, all the same. No Trace, also known as Murder by the Book, is a crime film from 1950 which benefits from a cast with strength in depth. It's the story of a crime novelist who finds himself driven by sheer desperation to commit murder. Ah, a familiar feeling, you may say. Perhaps I'll refrain from comment as to the plausibility of the premise! The novelist, Robert Southley, is very successful, and has a devoted and very attractive secretary (Dinah Sheridan) as well as chums in the police force - an inspector played by John Laurie, later of Dad's Army fame, and a sergeant who also fancies the secretary, who is played by Barry Morse, later the remorseless cop who pursued Richard Kimble for so long in the seemingly never-ending TV series The Fugitive. Southley is played by Hugh Sinclair, and this is one of those stories where a chap who is on the straight and narrow is suddenly confronted by someone from his less salubrious past who is intent on blackmail. We're asked to believe that the upright Southley was once a member of a gang that went around the US burgling places. I did find it difficult to suspend my belief here, a problem exacerbated by the fact that Sinclair is really the weakest link in the whole cast. I really wasn't sure what the secretary saw in him. The story unfolds rather nicely - it's one of those where we see a killer execute a clever plan, and the question is whether he'll get away with it or be tripped up by smart detective work. Along the way, there are roles for Dora Bryan and the ubiquitous Sam Kydd. All in all it's a very watchable film, although some fuzziness about Southley's characterisation means that it isn't quite as gripping as it might have been. The Test Match Murder, first published in 1936 (and not, as far as I know, ever reprinted) is my Forgotten Book for today. It was written by Denzil Batchelor, a British journalist and broadcaster who became interested in sports writing while working in Sydney. And this book is set, not as you might expect at Lord's Cricket Ground or The Oval, but in Sydney. England's star batsman, Franklyn, dies sensationally while walking out to the crease with his team already struggling at eight for three. I first became aware of Batchelor many years ago, after reading a witty cricket essay of his, but I didn't know he'd written a cricket-based crime novel. This is certainly an obscure one, and I had hopes that it might prove to be an undiscovered masterpiece. I'm afraid it is not, although it's amusing in patches - there's a nice spoof of the Great Detective character - and ends quite well. Franklyn has been poisoned by, of all things, curare. Someone at Sydney Cricket Ground has tampered with his batting glove. But who? Some of the detective work is done by Owen Brownlow and his sleuthing brother Latimer, but the official police investigator eventually takes centre stage. The story sags badly in the middle, with the introduction of dope gangs and even (despite the strictures of Ronald Knox) a mysterious Chinaman, These features never, in my experience, improve a Golden Age detective novel.. Overall, though, the book was worth persevering with. There's not much about cricket in it, which I found regrettable, but which those who don't love cricket may be glad to hear. Batchelor was a talented writer, and on his death at the age of 63 in 1969, his friends noted his great versatility. It was common in the mid-Thirties for people to dabble in detective fiction, and in some ways he reminds me of the better known Alan Melville, who also wrote crime stories early in his career. This book is very hard to find but despite its limitations, I'm glad I tracked down a copy. I was keen to take part in the Emirates Literature Festival for several reasons. One of them was the chance to meet several leading authors whom I'd never encountered in person before. It was a great pleasure to have several conversations with Kathy Reichs, and her husband Paul, and with another British crime writer and cricket lover, Vaseem Khan, and his wife Nirupama. But quite apart from people working in my genre, there was an eclectic mix of leading writers, from sci-fi superstar Peter F. Hamilton to well-known faces from the TV such as Jim Naughtie, Frank Gardner, and Alan Titchmarsh. And it was equally good to talk to a variety of readers, including a long time supporter of this blog, Golden Age collector Clint Stacey, and the daughter of someone I'd met in Madrid, of all places, the previous week; it's a very small world. There was a night-time desert feast, watching the flamingoes on the bank during a trip on the impressive new canal, a visit to the amazing opera house, with a talk given by the building's architect, and an ascent to the (almost) the top of the world's tallest building, the Burj Khalifa. At an event where the UAE was celebrated with a series of talks from leading local people, I chatted with Peter, who told me that detective elements play a part in his fiction. I'm now really keen to read his The Great North Road, despite his warning me that it's a very long novel! Listening to those local people talk, I sympathised with their frustration at media stereotypes of Dubai. As a leading local film-maker said, it's not really soulless, and to see it only as a place of shopping malls and retail therapy for lovers of bling is unfair. Thanks to oil, Dubai has come a long way in a short time, but people realise that the oil won't last forever, and they are making huge efforts to develop their cultural life. Education is a key priority, as the festival director emphasised, and many authors made a contribution to this by visiting schools in the area. It's not a perfect society, but then, I've yet to encounter a perfect society.Events such as the Festival help to foster understanding between people from very different backgrounds and cultures, and that has to be a good thing. 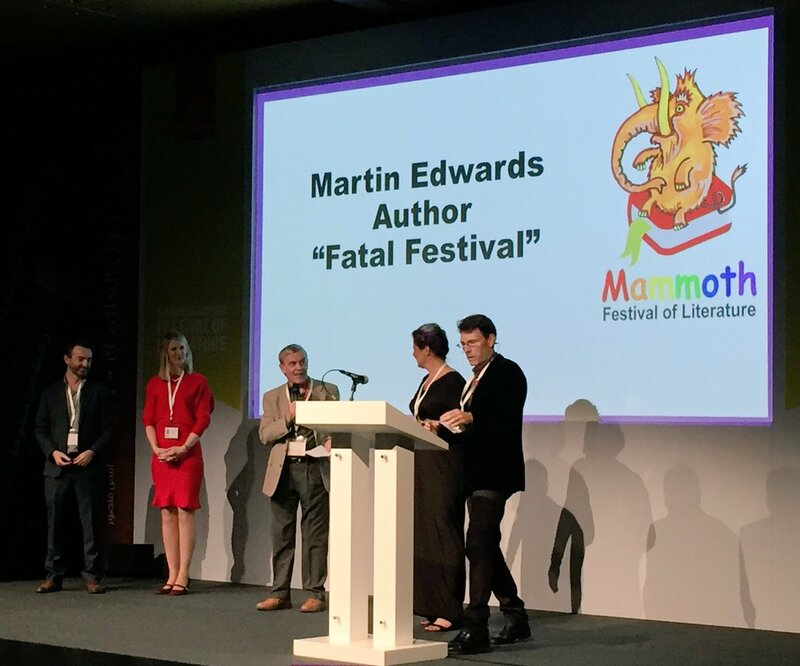 I've returned to the UK after a truly memorable trip to the United Arab Emirates, where I took part in the Emirates Airline Literature Festival. I've participated in a great many literary events over the past twenty-five years or so, but I can safely say that this festival in Dubai was very special, and not merely because its remit is the whole of literature, rather than just crime fiction, or because all the authors are exceptionally well looked after. It was a chance to meet some fascinating people, and also to have a glimpse of a country and a culture which I found extremely thought-provoking. Rob Davies of the British Library and I were interviewed by Ellah Wakatama Allfrey about the Golden Age of Murder, and I also took part in a panel with Kathy (whose debut novel I remember reading and admiring back in the late 90s, never dreaming I'd one day meet her) and Vaseem Khan, one of the rising stars of British crime fiction, moderated by Australia's Liz Porter. Both Ellah and Liz did a great job, and a question from the audience to Rob and me proved to come from a Daily Telegraph journalist, who duly wrote a story about the gender divide in terms of classic crime fiction. If time permits, I'll write a separate blog post about Dubai and Sharjah, and the other events I became involved in. For now, I'd just like to say how much I admired the hard work undertaken by Isobel Abulhoul, Yvette Judge, and their team, not forgetting the army of 800 (yes, 800, it's not a typo) volunteers and the world's snazziest green room (below photo). They all contributed to making it a week I (and I'm sure many others) will long remember with great appreciation. The revival of interest in the crime fiction of John Bude is nothing less than astonishing. A few years ago, I was barely aware of him, and had read none of his books. Then Nigel Moss, a keen collector of Golden Age fiction, and one of the most knowledgeable authorities on the subject, told me how much he liked Bude's work, and kindly gave me a copy of one of the author's books. Some time after that, the British Library asked me to write introductions to Bude's first two mysteries, which they were planning to reprint. The rest is history. The Cornish Coast Murder and The Lake District Murder proved hugely popular, and have since been followed in the Crime Classics series by The Sussex Downs Murder, The Cheltenham Square Murder, and Death on the Riviera. Another Bude novel is also due to appear in the series in due course - more of that at a later date. Meanwhile, I've been trying to find out as much about Bude and his work as I can, not least from members of his family, whose help has been invaluable. Despite the success of the Bude reprints, his other books are still very hard to find, but my Forgotten Book for today is his penultimate novel, published in 1958. A Twist of the Rope is praised by Herbert Harris in an essay about Bude in Twentieth Century Crime and Mystery Writers, dating back to 1980, and this tempted me to have a look at the story. It's a pacy novel, a thriller in much the same style and mood as those black and white crime B-movies that were popular in the late 50s.. It's a multiple viewpoint story. A deranged serial killer has escaped from an asylum, and takes refuge with an astonishingly obliging woman - I have to say that I found the police's failure to pick him up quickly rather unimpressive. We also follow the intertwined lives of several other people in the same small town, including a young guitar player called Johnny who falls for a rich but flaky young woman. When the girl is killed, it seems at first that the crazy serial killer is responsible. But Bude shifts the suspicion for the crime around quite neatly. It's a sound mystery, very much in keeping with its period, and reflecting Bude's desire to move with the times and update his approach to the genre, something he accomplished quite effectively. I was delighted to spot Guilty?, a black and white crime film dating back to 1956, in the Talking Pictures schedule. This movie, also known as By Whose Hand?, is based on Michael Gilbert's novel Death Has Deep Roots, published five years earlier, which I've read and enjoyed a couple of times. As far as I know, it's the only film based on a Gilbert book other than the better-known Danger Within, based on Death in Captivity. This is rather surprising, given that Gilbert wrote vividly; his work was very suitable for screen adaptation. Gilbert didn't write the screenplay - that was done by someone called Maurice J. Wilson. The credits reveal that additional dialogue was supplied by Ernest Dudley - who along with Gilbert was one of the founders of the Crime Writers' Association. But there is an even more intriguing connection to be deduced from the credits. The soundtrack was composed by Bruce Montgomery - the real name of Gilbert's fellow Detection Club member Edmund Crispin. Quite something to have a fellow crime writer produce the music for a film of your book! The story combines a courtroom drama - a young Frenchwoman is on trial for her life- with an adventurous investigation into a criminal conspiracy that dates back to the war and the Nazi occupation of France (hence the "deep roots"). The accused's solicitor is Nap Rumbold, one of those appealing characters who crop up sporadically in Gilbert's work without quite becoming major series characters. John Justin plays Rumbold, and does a a good job with a meaty part. Andree Debarr is his glamorous client, and Barbara Laage is a mysterious blonde woman who seems to be following Rumbold around for no particular reason. A sound cast includes such reliable actors as Russell Napier and Sydney Tafler., while Donald Wolfit plays the judge. I enjoyed the film, even though it doesn't match the excellence of the novel. Elizabeth is Missing, first published in 2014, was the first novel by Emma Healey. It became a Sunday Times bestseller, and won the Costa First Novel award. The book earned much critical acclaim - not least from the late, great Ruth Rendell. Rendell said, "I've never read anything quite like it", and this was not a double-edged choice of phrase. It really is a terrific novel. I suppose you'd call it a mainstream work of fiction, but it's also, arguably, a crime novel. It's a story told in the first person by Maud, an elderly woman who is suffering memory loss. Maud lives in her own house, but her forgetfulness is starting to become a real cause of concern to her daughter, who overcomes many frustrations and treats her mother, at least for the vast majority of the time, with a good deal of kindness. But we also see how challenging it can be to cope with a loved one who is ageing in this way. The patience of a saint is sometimes required, and very few of us are saints. Maud has become concerned that her friend Elizabeth can't be found, but she can't get anyone to take her seriously. As she frets about Elizabeth's absence, her mind goes back to her youth, and the disappearance of her older sister. It seems that people suspected that her sister was murdered, and there is more than one possible culprit, but the mystery was never solved. When I read this book, I didn't regard it first and foremost as a crime story. It's simply a great piece of writing about a wonderfully realised character and her life. At times I found it almost unbearably poignant. Suffice to say that it's one of the most impressive novels I've read in the past few years. I don't know how Emma Healey is going to surpass it, but I'll be fascinated to read her next book. She has tremendous talent. Although I've chosen one of his novels for today's Forgotten Book, the happy truth is that Edmund Crispin has never been entirely forgotten as a crime writer. I was recently interviewed about Crispin by a magazine in Colombia, of all places. I was told that Crispin's name is no longer very familiar over there, but I think I'm right in saying that he's always had some admirers in the US. And certainly the recent reissue of several of his books in the UK has kindled further interest here. In Buried for Pleasure, Gervase Fen rather rashly decides to stand for Parliament, and finds himself staying in a rickety inn in Sanford Angelorum, meeting an assortment of unlikely characters. These include a vicar who is plagued by a poltergeists, and although some of the scenes bear only a limited relation to the central mystery plot, they are never less than amusing and well-written. Fen comes across an undercover police officer, investigating a questionable recent death - occasioned by consuming - guess what? - poisoned chocolates. Soon the police officer himself is murdered, and there is an obvious suspect. But we all know that obvious suspects are innocent, right? (Unless the author is Agatha Christie, that is, and she has a cunning double-bluff in mind). I enjoyed this book. It's short and entertaining, and even if the murder mystery is flawed in some ways (I was irked that Fen's conversation with the deceased was censored so as to deprive us of vital information, but the whole story depended on this) it makes for a very good relaxing read - ideal for a holiday. The political stuff also is handled with a light touch. It's such a shame that Crispin's career was so short-lived. But he left a considerable literary legacy. The Talking Pictures TV channel has given me the chance to watch a fascinating mix of older films, including some old crime movies that until recently were highly obscure. Naturally, the quality varies. Some of the films are "quota quickies", short films produced to make sure that a statutory requirement supposed to foster the British film industry was met. As with so many protectionist measures, it wasn't really a great idea, and it didn't last too long. Some "quota quickies" were poor, others surprisingly good. Body Vanished, is a very short film from 1939, whose title gives you a clear idea of the storyline. It's a light comedy thriller, with Anthony Hulme cast as a police inspector, whose holiday with a journalist chum is rudely interrupted by a report of a murder. The crime scene is a country house, but the corpse cannot be found. Not at all a bad movie. Hulme also stars - in more than one role - in a shortish film set in Britain in the immediate aftermath of the Second World War, Mysterious Mr Nicholson.. A solicitor sends a young female employee out with a will - a rich client has decided to disinherit his wastrel nephew. Alas, by the time she arrives, the client has been murdered. I'm afraid this is a pretty feeble film - at one point, the scriptwriter seemed to give up the unequal struggle, so we're treated to a long scene in a music hall, with a performing dog act that has no relevance to the story. The big twist came as no surprise at all. Much better is a later film, Girl in the Picture, from 1957, directed by the very competent Don Chaffey. Donald Houston stars as a journalist investigating a cold case - the murder of a policeman. A photograph which shows a girl waving to the driver of a car believed to be that used by the killer, on the very day of the murder, leads him to pursue an ill-assorted pair of villains. There's not a lot of mystery in this one, but the pace is good, and Houston makes the most of his part.